Technicians must re-enter a European Automated Transfer Vehicle to tighten retention straps on cargo bags, a move that will delay the craft's launch on a logistics mission to the International Space Station by two weeks to around March 23, officials said Friday. The Automated Transfer Vehicle, already closed up inside the nose of an Ariane 5 rocket, was scheduled to launch March 9. But managers reviewing the readiness of the mission ordered a delay to give workers time to cinch two loose straps on two cargo bags, according to Massimo Cislaghi, the European Space Agency's ATV mission manager. The Ariane 5 launcher's payload fairing, which was lowered on top of the ATV spacecraft Feb. 27, will be removed and technicians will open the ship's forward hatch to enter its pressurized compartment. See photos of the fairing enclosing the ATV. Workers use a special mechanical elevator to be lowered inside the ATV when the craft is vertical on top of the Ariane launcher. It will take several days to remove the fairing, install the access equipment, open the hatch and enter the ATV. Most of the supplies inside the ship's cabin were loaded in late 2011, but workers added 1,280 pounds of so-called late cargo in February, while the ATV was already on top of its Ariane 5 rocket. The Ariane 5 is inside the final assembly building at the Guiana Space Center, a French-run spaceport on northeast coast of South America. It will roll to the launch pad the day before blastoff. "Even with this delay, at this time, we expect we can meet the ATV docking window that runs to the end of March," an ESA official posted on the mission's blog. 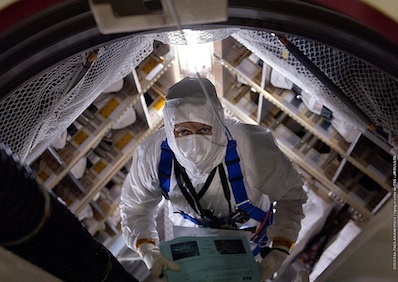 Based on the time needed to get access to the spacecraft, then close the hatch and encapsulate it inside the Ariane's aerodynamic shroud, ESA officials estimate the mission will lift off around March 23. Docking to the space station would occur around March 28, but the schedule could be adjusted when officials set an official launch date. It is the third of five missions in the ATV program. The 32-foot-long Automated Transfer Vehicle is hauling more than 14,000 pounds of dry cargo, propellant, water and breathing air to the space station. After the retirement of the space shuttle, the ATV is the station's largest resupply craft. 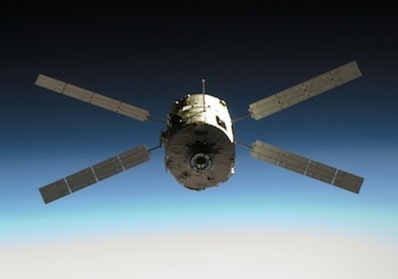 After its launch and docking to the station in late March, the ATV will remain attached to the complex for more than five months. It was scheduled to depart the outpost in early September before ESA announced the launch delay. ATV 3 is nicknamed Edoardo Amaldi after the Italian physicist who made groundbreaking discoveries in nuclear and particle physics and later helped foster the precursor to ESA.